From delicious twists on classic comfort foods to more delicate picnic-perfect dishes, there are many picnic food options that can satisfy even the most discerning taste buds. 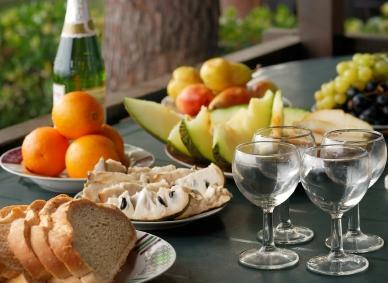 Whether you want to enjoy a casual meal or an elegant outdoor dining experience, it's not difficult to put together a delightful picnic that you and your companions are sure to enjoy. Fresh air paired with freshly packed picnic food is a wonderful combination. Sunshine and outdoor activity can create hearty appetites, so a favorite category of picnic foods is the sandwich -- perfect in its portability and ability to ease hunger. While classic picnic sandwiches like ham and cheese are popular, there are also many ways to create more exciting picnic sandwiches. Try one of the following ideas to create a super-charged taste infusion and take your picnic sandwich from so-so to spectacular! Be sure any sandwiches, side dishes, or other cold picnic foods that include mayonnaise, meat, or dairy are kept chilled. Spiced Up Ham and Swiss: Use thick slices of pre-cooked spiral ham and Swiss cheese on a dark bread, such as pumpernickel or rye. Mix regular mayonnaise and ground horseradish together to taste in a small bowl, then spread both sides of the bread with the zippy spread. Use lean deli ham and a lower-fat mayo, such as Kraft olive oil based mayonnaise, to cut calories. Chicken BLT: Start with pre-cooked boneless, skinless chicken breasts and ready-to-eat or previously cooked bacon slices. Toast thick slices of fresh Italian bread in the toaster, and spread with mayonnaise. Add chicken, bacon, lettuce, and tomato for a delicious and filling take on the standard BLT. For a lower calorie version, use turkey bacon and low fat mayo. Turkey and Avocado Sandwich: Whole grain or oat bread topped with chipotle sauce, sliced turkey breast, lettuce, tomato, and avocado sauce makes a spicy-smooth picnic sandwich. Gourmet Tuna Salad: Dress up your standard tuna salad with new ingredients, and tuck it into a pita or spoon onto a croissant for a delicious and cost-effective sandwich. Tuna, apples, raisins, and pecans with mayonnaise create a sweet and savory tuna salad, or diced green pepper, olives, and Italian dressing or balsamic vinegar and oil create an Italian-inspired version. Salmon Sandwiches: Skip canned salmon, and instead use chunks of previously cooked salmon for a wonderful tasting sandwich. Toss salmon with lemon juice and dill, and spread whipped cream cheese on your choice of bread or croissant. Antipasto sandwich: Layer a baguette or other artisan bread with salami, ham, provolone or mozzarella cheese, olives, and pesto spread for a portable take on antipasto salad. Make potato salads with baby Yukon, baby red, or other flavorful potatoes instead of the traditional white potato. Consider unique flavorings in addition to your mayonnaise or salad dressing, such as dill or rosemary. Mustard and oil-based dressings for potato salads are also a wonderful way to turn potato salad into a more upscale dish. Sour cream, garlic, bacon bits, and your favorite potato can also make a tempting rendition of potato salad. Pasta salads are incredibly versatile - create new, classy versions by using unique pastas and adding fresh herbs or other additions, such as sun dried tomatoes, marinated artichoke hearts, capers, and red onion, to your base dressing. If you like pasta salads with cheese, try Asiago, chunks of Swiss, or crumbled feta or blue cheese. 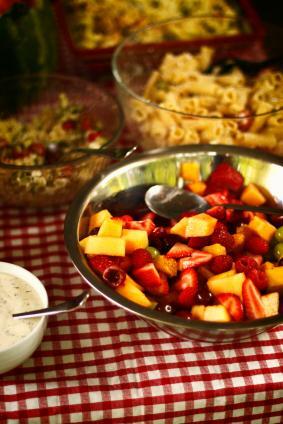 Turn an ordinary fruit salad into a fabulous new food idea for a picnic by varying the presentation, flavor combinations, and dressings. Instead of fruit salad in a bowl, string chunks of fresh fruit onto skewers and serve with whipped topping. Make a berry fruit salad infused with chocolate chunks, a citrus-based fruit salad with coconut and nuts, or toss fresh mint leaves and coarse ground sugar with fresh melon for a simple and eye-catching fruit salad. A portable alternative to sandwiches are cold pizzas. Rolled out crescent rolls, biscuit dough, or regular pizza crust works well for the crust. Top the crust with cream or other spreadable cheese or olive oil, then top with fresh veggies, shredded cheese, and flavorful slices of meats. Cold fruit pizzas also make a sweet ending to the meal. Sweet cream cheese or caramel spreads pair well with cinnamon roll or crescent roll dough. Apples, sliced grapes, berries, and other seasonal fruits make perfect toppings. Breakfast picnic: Skip the sandwiches in favor of a breakfast picnic theme. Pack fruit and fruit salads, muffins, mini quiches, cinnamon rolls, stuffed eggs, smoked meat and cheese with croissants or bagels, and juice or coffee for a fun picnic spread. 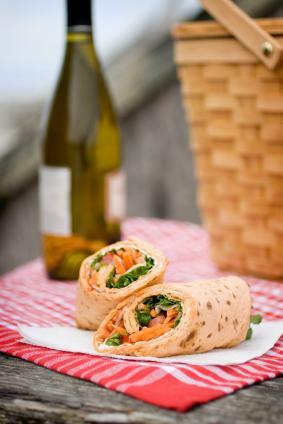 Appetizer picnic: An appetizer picnic menu is romantic and fun. Smoked meats and cheeses with crackers, stuffed mushrooms, fresh vegetables and dip, hummus and pita chips, shrimp cocktail, mini sandwich wraps, and bite size cakes, cheesecakes, or pastries are great choices for this type of picnic. Dessert picnic: For a sweet way to finish off a summer evening, plan a simple dessert picnic. Cupcakes, brownie bites or squares, fresh fruit, mini cakes, puff pastry, cookies, slices of fruit pie, lemon bars, chocolate covered strawberries, slices of pound cake, and chocolate mousse cups all make lovely fare for a dessert picnic. Classic picnic: Items like cold fried chicken, coleslaw, potato salad, baked beans, freshly baked brownies, slices of watermelon, and ice-cold lemonade make a perfect classic picnic menu. While individual tastes certainly differ, utilizing a variety of picnic foods can help you create a perfect outdoor meal. From themed picnic menus to upscale versions of your favorite picnic foods, incorporating a variety of dishes and ingredients can help satisfy any palate.